While boxes of decadent chocolate treats, celebratory champagne and romantic, high-calorie dinners may dance in your mind as a way to celebrate Valentine’s Day, your heart may be pining for something else. With Valentine's Day just around the corner, it is a great time to look at the state of your heart. 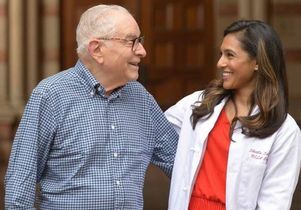 Despite recent progress, cardiovascular disease remains the leading cause of death for both men and women in the United States," said Dr. Sheila Sahni, interventional cardiology fellow at the David Geffen School of Medicine at UCLA and the UCLA Barbra Streisand Women’s Heart Health Program. “Making heart-healthy lifestyle choices and taking control of your cardiovascular risk factors can help prevent or slow the progression of heart disease. Everyday decisions are important to cardiovascular health, she added, and Valentine’s Day is a good time to give yourself the gift of lifestyle changes that will benefit you through the year. Check out these tips. Stay active: The key to heart health is to keep moving and avoid being sedentary. Ideally, aim to get your heart rate up with at least 30 minutes of aerobic exercise at least five days a week. However, any movement will be good for your heart so keep moving and stay active. Limit your consumption of red meat, sugar and unhealthy fats. There are plenty of foods you can eat instead to enjoy a heart-healthy diet. Add fruits and vegetables to your diet to increase your fiber consumption. Reduce your salt intake. Can’t imagine your favorite foods without that added salt? Over time, however, you can re-train your taste buds to become accustomed to a lower-sodium diet, and you will start to notice subtle flavors in your foods again. Stop smoking. Smoking not only damages your lungs, it also negatively affects your heart health. Once you stop smoking, your odds of developing heart disease drops rapidly. Breaking that smoking habit is essential for your overall health. Keep your weight under control. Ask your doctor if you are overweight. Obesity increases the risk of heart attacks, heart failure and diabetes. A healthy diet with portion control and regular exercise is the best way to maintain a healthy weight. Know your cholesterol levels: High cholesterol is a risk factor for heart disease. If you have not had your cholesterol levels checked in the past year or two, get them checked now to find out if you’re at risk for heart disease. Know your blood pressure: High blood pressure, or hypertension, is a major risk factor for heart attacks, strokes and heart failure. Many people with high blood pressure are unaware that they have this condition. There are effective treatments for hypertension in addition to lifestyle modifications of exercise and salt reduction. Know your blood sugar levels: Over time, elevated blood sugar levels can lead to diabetes, a strong risk factor for heart disease. Ask your doctor if you are at risk. If you are pre-diabetic or have “early” diabetes, lifestyle changes can be effective. Reduce stress: Stress is a strong risk factor for heart disease, especially for women. Try meditation, yoga, or simply being silent and still for 10 minutes a day. Be mindful of stress in your life and take extra care of your heart. See your doctor regularly. Regular medical follow-up is one of the best ways to prevent cardiovascular disease. Studies show that individuals who stop their cardiovascular medications are at higher risk for heart attacks, strokes, heart failure and reduced survival. The American Heart Association has set up “Healthy for Good” online support and information resource to help you to eat well, stay active and be healthy. Commit to nurturing your heart this Valentine’s Day.